Investors buy gold when they lose trust in currencies, and they sell gold when they can expect high interest rates on currencies. As the following chart illustrates, gold went up radically after the Fed started the quantitative easing in 2008 to support the US economy hurt by the mortgage loan crisis, and the bubble burst as the Fed stopped the QE and started raising rates. 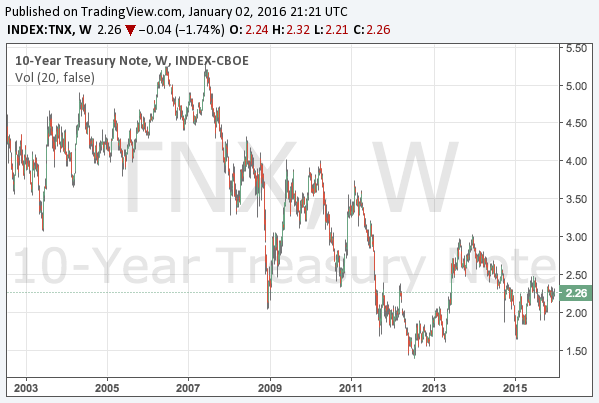 The Fed is expected to continue to raise rates in 2016, and the fact itself is negative for the gold price. However, investors must consider how much of the future rate hikes are already in the gold price and how much of that expectation will be actualized. As we have been insisting for a long time, it will not happen that the Fed will continue to raise interest rates as much as it wants, and the financial markets will not collapse. The central banks of the major economies have printed trillions of dollars, for which investors have kept buying stocks and bonds, and without which they have no incentive to hold them. The markets seem to have forgotten this, but they will recall it when bond yields recover to the attractive level, and investors try to sell stocks to buy bonds. The time will come for stocks and bonds to fight against each other for money, at which point the Fed will have to admit it cannot raise rates any longer and turn dovish. The article expects that the US economy will slow down to such a level that requires a stimulus in late 2016 or early 2017. Therefore, considering both the markets and the economy, we expect the Fed can hardly raise rates more than 4 times and will eventually admit it can no longer raise rates, at which point gold will go up radically. For your information, Jim Rogers, a famous investor, said rate hikes would be maximally 3 times. The exact number shall be left for the readers to decide. Generally speaking, the more dovish these numbers become, the better for the gold price. The most likely possibility is considered to be 1.00%. This means 4 rate hikes are expected in the end of 2016, and it is the same as what we consider as the maximum number. If our prediction is right, it means the federal funds futures cannot be more hawkish. On the other hand, the US long-term interest rates still remain low, influenced by the low rates in the euro zone. The Spanish government bonds, for example, cannot be too much more trusted than the US bonds, and therefore as long as the ECB (European Central Bank) continues the QE, the US long-term interest rates could also remain low. The yield could go up depending on the investors confidence on the bonds in the euro zone, which could be negative for the gold price as investors might like to buy the dollar for the high interest rates. It is relatively difficult to predict the future of the long-term interest rates. The deflationary force would be likely to lower them. If the slowdown of the world economy reveals quickly, there could be no opportunity for gold to go down. On the other hand, if the US economy is still somehow surviving in the end of 2016, the Fed might forcibly try the fifth rate hike. In this case, the gold price might fall into the range between $800 and $1,000, which, however, would be the very bottom of the gold price. It is merely probable whether or not the fall would come. Therefore, the writer has decided to divide the purchase into three timings. The first purchase is already done between the price of $1,050 and $1,080. Since the federal funds futures are already maximally hawkish, we would not expect further negative news for gold in a short term. This position might cause a loss in 2016, but the writer is prepared for the possibility. The second opportunity will be when we observe the decisive clue for the slowdown of the US economy. We expect this will be in late 2016 or early 2017. The third opportunity is optional and only happens when the Fed remains hawkish in the end of 2016, and the gold price falls into the range from $800 to $1,000. The Fed is basically very eager for rate hikes for the reason we already explained. So, the best buying opportunity might be likely to happen. We would look forward to it. Regardless of the process, if the Fed admits it needs to restart easing, we expect the gold price will eventually reach its highest in 2011 and go beyond $2,000. 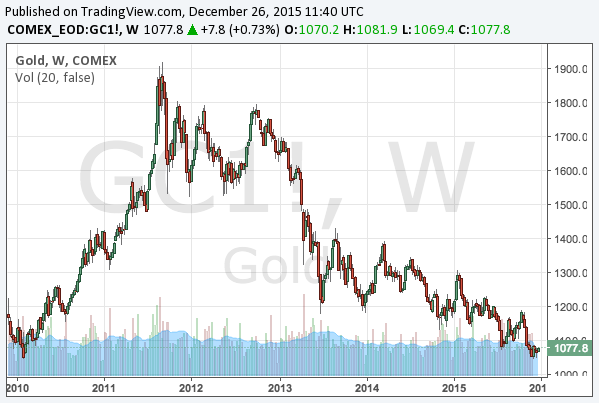 Gold is the last hope in this unprofitable market in 2016.